Exxon currently pays a dividend of $0.63 per quarter for a $2.52 annual dividend. At the close of market on Monday, December 23th XOM’s price per share was $98.51. This gives the stock a current dividend yield of 2.56%. Normally I look for a dividend yield of at least 3%, so I wouldn´t be satisfied with this dividend yield from XOM. In 2003, Exxon paid an annual dividend amount of $0.98 per share. The dividend trend has been up each year as it now pays $2.52 annually per share. This gives XOM a 10 year annual compound dividend growth rate of 9.01%. Exxon has increased its dividend for more than three decades. Exxon´s dividend growth rate has been good on last 3, 5 and 10 years, 9.51%, 9.74% and 9.01%. 1 year growth rate is great 17.84%. Exxon normally pay dividend in March, June, September and December. Exxon's EPS has grown an average of 19.16% over the past 10 years, 5.91% in the past five years. The past three years, EPS has grown nicely 34.57%, and in the past year growth has been 15.20%. 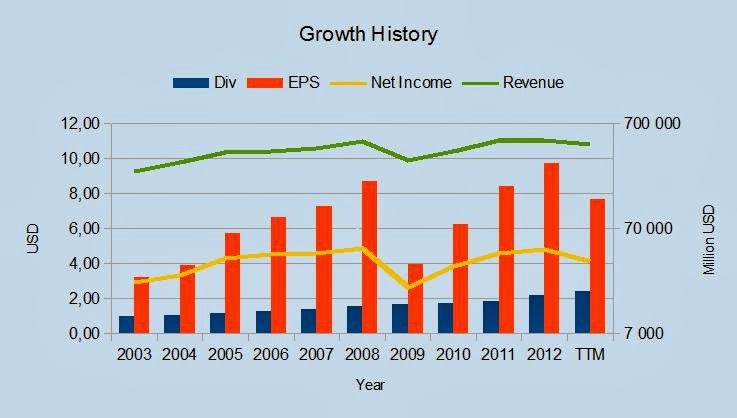 Exxon's EPS of development in recent years seems to be very good. Analyst estimates for 5 years earnigs growth rate per annum are 2.35% (http://finance.yahoo.com/q/ae?s=XOM+Analyst+Estimates) That looks very low estimate, to compare, how EPS has grown up earlier. Exxon's net income has increased by an average of 14.63% over the past 10 years, 2.02% in the past five years. In last three years net income grown up 32.53% and last year 9.30%. Net income trend looks similar to the EPS trend. Exxon's revenue has increased 8.96% over the past 10 years, 3.58% in the last 5 years. Also, in the last 3 years, profits have grown comfortable 32.53%, only last year, revenue fell by –0.85%. Exxon`s amount of shares has go down nicely, except on year 2010 those increased, but after that has continue go down. 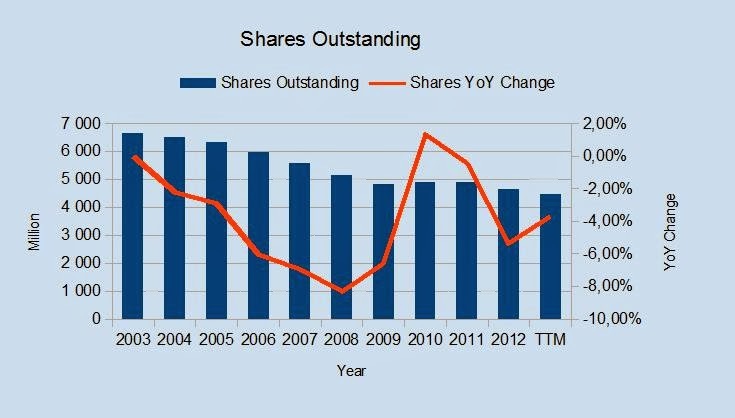 That I like, because less shares outstanding, my shares are giving me a larger portion of the earnings. 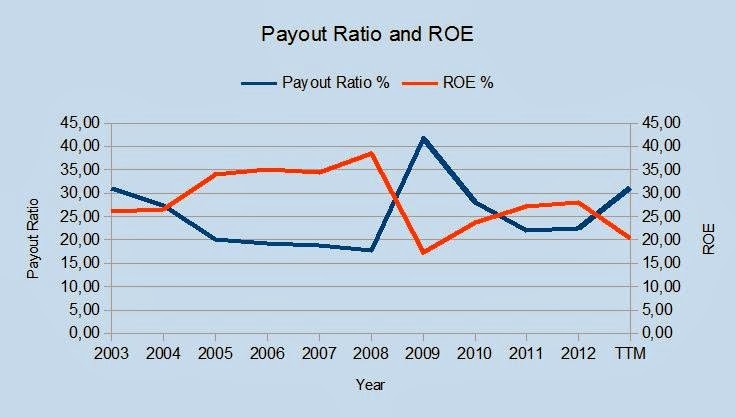 Exxon's dividend payout ratio has been in the past 10 years on average 24.83%. This means that Exxon will distribute about a quarter of the profits to shareholders, and put rest of the new investment, as well as increases the value of shares through share repurchases. It suits me very well. Exxon's ROE has been around 29% over the past 10 years, which seems to be very good. Current ratio measures the company's ability to meet short-term obligations. Exxon has current ratio 1.01 at the end of 2012. This means that the funds will be able to cover 101% of current liability obligations. I usually like the current ratio is greater than 1, so Exxon looks ok in this case. This number tells me how many years it will take to pay off the current long term debt of the company by using all net profit into it. I want this ratio to be less than 5, because the company is able to pay for all long-term debt from less than five years and on my opinion then company don´t have too much debt. 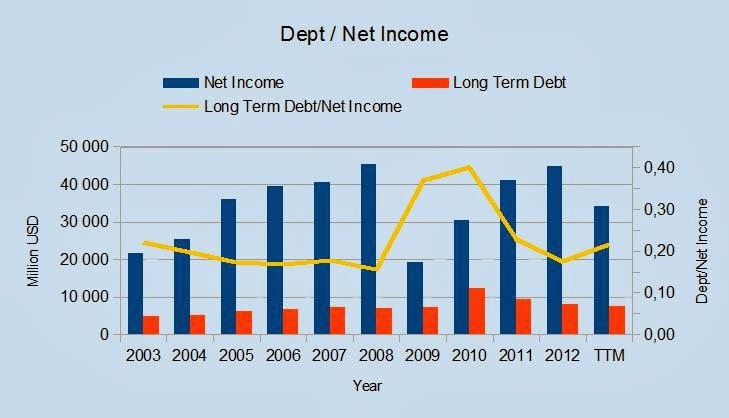 Exxon`s long term debt has been clearly under 5 times net profit on last 10 years, In the last 10-year average is 0.23, last year it was 0.22. Exxon`s current P/E are 12.9, which are over to it`s historical 5 years average high (12.77) and also over 10 years average high (12.65). By calculating using estimated EPS 7.45 for year 2013 and the average 5-year low P/E ratio (9.39) shares fair value will be $69.96. Using the 10-year average low P/E ratio (9.36), fair value will be $69.74. Calculating with 5 year average P/E ratio (11.08), fair value will be $82.53, with 10 year average P/E ratio (11.01) fair value will be $82.00. Exxon`s current annual dividend are $2.52. At the close of market on Monday, December 23th XOM’s price per share was $98.51. This gives the stock a current dividend yield of 2.66%. Average 5 years high dividend yields has been 2.82% and average 10 years high dividend yields has been 2.56%. Those dividend yields gives share fair value $89.21 for 5 and $95.27 for 10 years. Calculating with 5 year average yield 2.39%, fair value will be $105.48, with 10 year average yield 2.25%, fair value will be $112.07. Exxon`s current P/S ratio are 0.99 with revenue estimates for year 2013 (447.55B). Average 5 years low P/S ratio are 0.74 and average 10 years low P/S ratio are 0.81. By calculating using estimated revenue for year 2013 and the average 5 years low P/S ratio fair value will be $74.16. Using the 10 years average low P/S ratio, fair value will be $81.28. Calculating with 5 year average P/S ratio (0.87), fair value will be $87.70, with 10 year average P/S ratio (0.95) fair value will be $95.70. Analyst estimates for 5 years earnings growth rate per annum are 2.35%. I will use on my calculation 66% of that, which are 1.55%. Then I assume that continue growth after 5 years will be 3%. I use discount rate 10% and EPS $7.66. Total I calculate for next 30 years. That will give me share fair value $92.23. Exxon`s current annual dividend are $2.52. I assume that Exxon will be able to grow dividends for the next 5 years at the lowest of the 1, 3, 5, or 10 year growth rates or 15%. In this case that would be 9.01%. Then I assume that after 5 years grow rate will be 5%. To calculate the value I used a discount rate of 10%. Total I calculate again for next 30 years. That will give me share fair value $77.42. Exxon has EPS 7.66 (ttm). When I calculate Exxon`s future price with analyst estimate for 5 years EPS growth (2.35)% and using low P/E ratio last 5 years, I came for price $80.76. That would give about 18% downside for XOM´s current price. Exxon are a great company with 31 years continuing dividend increase and I would like to have some shares of it in my portfolio. Based on my analysis, I think Exxon are ​​currently overvalued, and I am not prepared at this time to invest in it. If the price would fall under $83, then I might be interested on it. Disclosure: I do not own any shares of XOM.